What’s your biggest money worry? Your answer might depend on where you live, finds the 2015 Life + Money Survey from GOBankingRates. 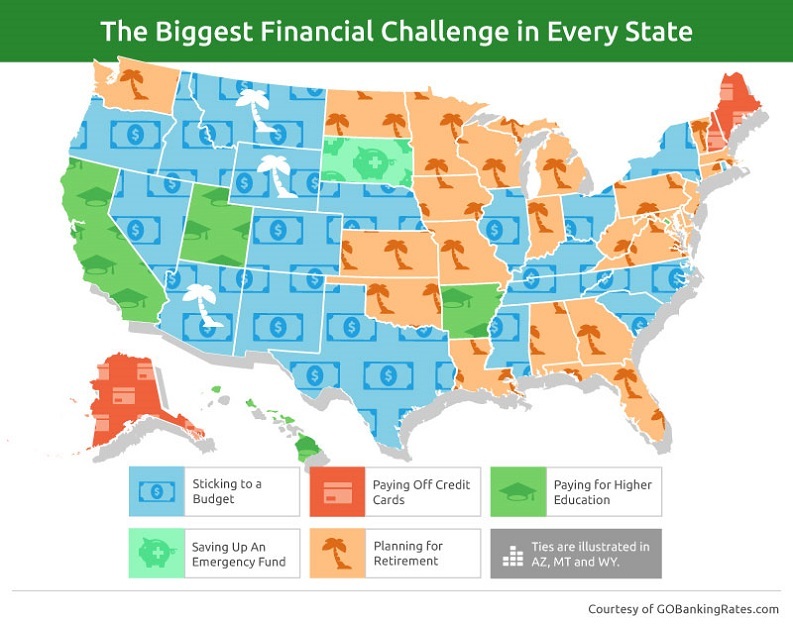 This survey asked Americans, “What’s your biggest financial challenge?” and collected responses from residents of all 50 states and the District of Columbia to find the most common money struggle in each state. More than half of all U.S. states name retirement planning as their biggest financial challenge, followed by over a third of states saying they struggle most with sticking to a budget. About 10 percent of states have residents that say paying for higher education is their biggest challenge, followed by paying off credit cards (6 percent) and saving for an emergency (2 percent). Though saving for a home and building an investment portfolio were included as two other possible answers in the survey, neither was the top answer in any state. When it comes to sticking to a budget, states in the West are most likely to be focused on this challenge — it’s the top financial concern of about 60 percent (eight of 13) of states in this region. Planning for retirement is the top challenge of states in the South, Midwest and Northeast regions. Two-thirds of Midwest states say retirement planning is their biggest challenge, making this the region most focused on this financial concern. Only five states and the District named paying for higher education as their top concern, and half of those states are in the West (California, Hawaii and Utah). Of the three states that name paying off credit cards as their top challenge, two are in the Northeast — Maine and New Hampshire. South Dakota is the only state for which saving an emergency fund is the top concern. “What’s Next” for Americans’ Finances? The 2015 Life + Money Survey highlights how people across the U.S. think about money. When facing any of the financial challenges covered in the survey, people can benefit from professional advice. GOBankingRates’ “What’s Next?” section offers assistance with understanding how to create smart financial plans. In this section, you can request free financial services to help address your biggest money challenges. Retirement Fund or Emergency Fund: Which Do I Save for First?